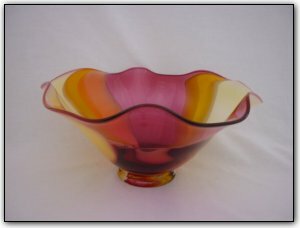 This fluted bowl features translucent shades of pinks, yellows, and oranges. The light flutes provide subtle accents and the bowl sits atop a base of the same colors. Measuring nearly a foot across, its the perfect size for a coffee table, countertop, or just about anywhere that could use a colorful accent piece.